Can’t decide which of our luscious body butters you want? Here is a perfect opportunity to enjoy ALL of our creations! Our sampler pack comes with a 1.5 ounce jar of each of our 4 body butters—SkinFood, DreamCream, SweetFeet, and BabyBump! goddess tip: These mini sized jars make excellent travel companions. Be aware…they melt more easily in these smaller sizes! 4 x 1.5 oz. 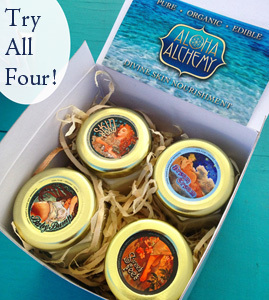 jars in a white cardstock box with Aloha Alchemy logo.